From our Unique Beaded Fringe Collection (trims under 1 1/2" long)Beautiful black and crystal clear beaded fringe trim. The beaded strands are 1 1/2" long not including the satin ribbon. 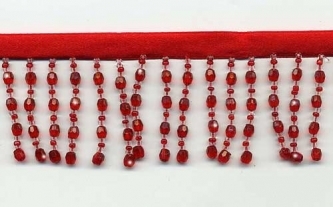 Beautiful red and crystal clear beaded fringe trim. The beaded strands are 1 1/2" long not including the satin ribbon.